With their debut album Instinct recently released in the US, Niki & the Dove were an apt opener for Twin Shadow. Lead singer Malin Dahlström is reminiscent of a modern Cyndi Lauper, while also showing serious deference to fellow Swedish indie star Karin Dreijer of The Knife. Gothic and quirky in the same beat, Dahlström had strong stage presence and a powerful voice to back up what might be construed as overly dramatic dance moves. Keyboardist and guitarist Gustaf Karlöf was a solid but quiet presence, contributing the occasional vocal and any extra instrumentation, ranging from the Maracas to the rarely-seen-live Chinese hand drum, the Bolang Gu (波浪鼓). The band was much more impressive live than we imagined from our listens of the album, which sounded like a rather commonplace synthy dance record. Dahlström called up a kind of Stevie Nicks-esque attire, complete with glowing feather fans. She really sold it, and the music was upbeat, fun, and relevant. Something about it screamed Prince, or even a Prince-Fleetwood Mac hybrid, minus the sexed-up dance moves. She did inspire gentle swaying and beyond from the audience, especially during their more recognizable songs like “Last Night” and “DJ, Ease My Mind.” Endearingly European, both Dahlström and Karlöf were beyond thankful for the crowd’s attention, and very happy to be opening for Twin Shadow, especially in Williamsburg. Very fun live, the band promised to return to the US for more tours over the next year. With a rabid fan base far beyond what we had imagined, Twin Shadow‘s main man, George Lewis, Jr., was very clearly the focus of the show. Much screaming ensued when he appeared on stage with Niki & The Dove, and it was all the more deafening when he walked out for his set with Twin Shadow. He showed much love for Brooklyn (and much disdain for Manhattan, Boston, and LA, even though LA is where he makes his home now), which inspired even more cheering. And it was deserved: he played a great, energetic set, with a perfect mix of songs from his beautiful debut Forget, and his newest, Confess. The set began with a ballad, as Lewis took the stage alone and sang a moving rendition of “The One.” But soon the party started, as his band joined him onstage and launched into “When We’re Dancing.” Favorites like “Slow,” “Golden Light” and “Five Seconds” inspired intense adoration and dancing from the audience and it was obvious the band was having a great time as well. Very personable, Lewis cajoled the crowd into screaming at the top of their lungs to start off “At My Heels,” which then triggered the release of a waterfall of black and gold balloons from the ceiling. Note to bands: adding balloons to your set means instant drama and fun! 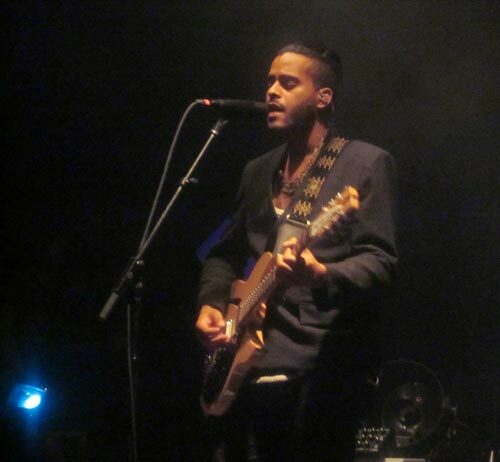 Twin Shadow’s 11-song set ended with “When the Movie’s Over” and “Forget”, bringing the mood down a few notches before the band left the stage to let the crowd shout it out for an encore. Said encore began with the hauntingly beautiful “Castles in the Snow”, and then Lewis asked Niki & The Dove to join them onstage, thanking them for being such great tourmates. The band then played the familiar opening notes of Queen and David Bowie’s “Under Pressure,” transforming the venue into a joyful dance party that left the crowd buzzing for several minutes after everyone left the stage.